An official price has not yet been announced for the vessel, but this is likely to be somewhere in the millions if the firm's promotional images and material are anything to go by. Customers wishing to purchase one will have to wait an average of 12 months before delivery. Foiler is the creation of Enata Marine, based in Sharjah, the third largest and third most populous city in the United Arab Emirates. As water is 840 times denser than the air, the foils can be much smaller than the wings of a plane and still lift the boat. 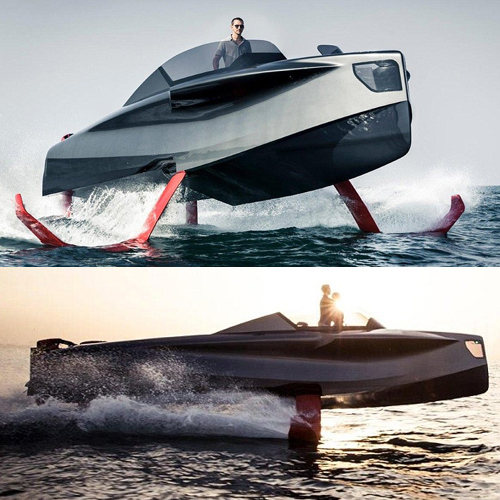 As the boat's speed increases, the foils start to lift the Foiler, like a plane on a runway before takeoff.